Pope Francis wants to be seen as the cool modern Pope who’s down with LGBTQ people, but he keeps tripping over his own feet every time he tries. On the Papal plane on his way back from a contentious visit to Ireland, where he was pressed on the church’s continued cover up of the sexual abuse of children by church authorities, Francis took time to answer reporters’ questions. With LGBTQ families and the church’s refusal to allow gay Catholics to participate in the Irish gathering, one reporter asked the Pope what he would say to a parent who “observe homosexual traits” in their child. “I would say first of all pray, not to condemn, to dialogue, to understand, to give space to the son or the daughter,” he responded, noting that parents must also consider the child’s age. “When it [homosexuality] shows itself from childhood, there is a lot that can be done through psychiatry, to see how things are. It is something else if it shows itself after 20 years,” he said. That’s right. 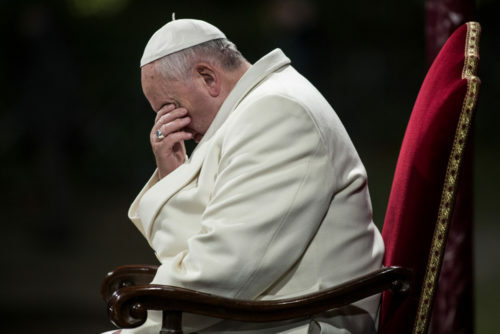 The Pope seemingly endorsed notorious “ex-gay therapy,” a form of psychological torture banned in parts of the United States, by implying that being gay is a psychological problem. The Vatican is already walking back the Pope’s statement, saying that he didn’t mean to imply gay kids had psychological problems. When they published a transcript of his back and forth with reporters, they deliberately cut out his reference to psychiatry. “When the Pope referred to ‘psychiatry’, it is clear that he was doing it to highlight an example of ‘things that can be done’. But with that word he didn’t mean to say that it (homosexuality) was a ‘mental illness’,” a Vatican spokeswoman told Agence France-Presse.